I have to admit that I have been eying this award for quite some time. Is it not the MOST hysterical, creative button you have ever seen?! Truthfully, I read the description and while I could immediately think of several blogs that I knew deserved this coveted award, I never thought my blog would be so honored. 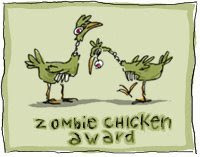 I am very grateful to Lilly and Melissa for thinking of me when paying forward their good fortune, but I have to wonder if there is something rather dubious about receiving the zombie chicken twice in one day. I always have the hardest time with the selection process of passing along these awards. I currently “follow” about 150 blogs and no joke, there are at least 30 of those blogs that I anxiously wait for daily postings so that I can read what they have to say – what is going on in their lives – what books they suggest for my TBR pile. I have honored all of these lovely blogs several times in the past, and I am afraid that they may grow weary of my constant praise (although truly…is there such a thing as too much praise – if it is sincere and from the heart?!). So…let me start out by saying that if you have received an award from me before — you are also a recipient of this one as well. As some of you know, I have decided to spread my wings, so to speak, and host a summer reading challenge. I am still working out all the details, but hope to have an official post published sometime later this week. In the meantime, I want to publicly thank Robin at A Fondness for Reading for designing the buttons that I will use for the challenge. I am photo-software challenged, and she willingly volunteered to make them for me. I am still in need of some tutorial help with setting up a Mr. Linky for the challenge, so if you are available to help, I will be happy to also award one of these cute buttons to you as well. If there are any of you who have received blog help that you would like to publicly acknowledge, please feel free to copy Robin’s button and pass it along the heart-felt appreciation. Oh! Thank you so much! 😀 What an awesome award; I agree about the button. Thanks, Molly, for the Appreciation Award! I find that there are a lot of people to appreciate in the book blogging world. Good luck with your new challenge. I’m thinking of which books on my TBR shelf to read for it. Well thank you very much Molly! I’ll have to have a peek at the other lucky recipients, this reading of blogs is highly addictive isn’t it. Congratulations, Molly. I love your blog, too! & if you're still looking for help w/ Mr. Linky, let me know. We can do this via email. dreyshouse at gmail dot com.